The diverse and wild ecosystems that span more than 100 acres across our mountain offer the best of convenience and vast natural beauty to explore. At Camp Waubanong we work daily to achieve a cultural intervention that will bring back into our modern lives a necessary and healthy relationship with the natural world. In all that we do, we role model a sense of appreciation, gratitude, and reverence for the abundance that the natural world provides for us. Through this act of thanksgiving we begin to see our direct impacts and the great potential we each have to nurture the health of our environment as well as our human family. We have passion for each activity that we lead, story we share, or skill we teach, we draw from a place of personal inspiration. In doing so we create a learning atmosphere that motivates campers to explore nature, to practice skills and to share their experience with others outside of our programs. We support individual growth by encouraging each participant to see and move beyond their perceived limits while experiencing and exploring their roles in a supportive community. We believe that by achieving the balance of individual & group mind we are fostering a generation of courageous, innovative and caring human beings. WHO COMES TO CAMP WAUBANONG? Camp Waubanong is proud to be the summer “home” for boys & girls ages 4-17 though we run many programs throughout the year…Fall, Winter, Spring and Summer. Our curriculum covered is seasonal according to the Natural Laws and cycles of nature. For the development of wilderness living skills, it is necessary that we follow the rhythms of the Earth by harvesting materials and creating our earthen wares in the proper season. Our campers have come from all corners of the world to experience Waubanong community and foster life-long relationships with the natural world through exceptional mentoring and nature education. Kids have been learning and growing at this summer camp year after year. The basket of community that has been woven at Camp Waubanong for near 100 years continues to grow and evolve with numerous new programs. Camp Waubanong is a place where each individual can feel at home among peers and mentors within the elements of nature. Experiencing the non-judgmental simplicity and expansiveness of nature within a supportive group creates a powerful space for healthy personal growth. what do we actually do out there? Our wilderness education and nature immersion programs combine ancient skills with modern tools of mentoring. In addition to building skills we build community and hope that each and every participant will take what they learn back to their own communities. We do this through exploration and experience in the natural world. We are outside in all weather and all seasons, witnessing firsthand how plants and animals change and adapt with the earth’s turning, including us! We believe that if we can help people to feel a part of the world around them, and help them to ask great questions, then wherever they go they will have the tools to feel at home in and learn about their environment. While our experienced instructor teams design a different theme for each session and prepare activities for each day, we are also very student-centered, following individual interest and the teachings of the earth in the moment. Participants are encouraged to bring their own interests and to share them, as well as to explore the group focus for the day. Epic games, quiet time to connect with a “sit spot”, making fires, noticing what’s different this week outside and inside of themselves, and unstructured free play are all a part of a typical day. There is a lot of freedom and confidence that comes from learning fundamental skills for not just surviving, but thriving in nature with only the natural materials that surround you. How might you feel differently in the landscape once you have mastered some of the primitive skills listed below? Find one or build one for survival, concealment, wilderness living or just plain fun. Shelters are home base for any survival situation and are great containers for exploration, growth and sharing. Finding water is a top priority in the wild. Humans can survive only a few days without water. We explore many ways of finding and purifying this precious commodity. Mastering the art and science of creating fire with raw materials gathered from the land. Building smokeless fires in all types of weather, and forming habits of fire safety. Beyond rubbing two sticks together, fire making provides an experiential learning platform for tree identification, resource extraction, ecology, physics, body mechanics, teamwork & more. Where wilderness survival becomes outdoor recreation! There's no better way to tame the uncertainties of life than to cook your meals healthfully over a fire without pots or other modern amenities. Gathering foods from the wild, learning how to identify plants, understanding invasive species ecology and native species regeneration, plant taxonomy, and of course - eating your vegetables! Learning these concepts under the magical invisibility cloak of FUN is education at it's best. Knowing how NOT to get lost, how to to find your way and feel at home no matter where you're going. Does moss really grow on the north side of a tree? No compass, no smart phone... no problem! Perhaps one of the most overlooked survival skills! Knowing how to see and identify the things that can bring you harm and get you into real trouble is, in fact, where we often begin; not to frighten, but to empower one to explore the world safely. By learning to understand the marks made by every living thing, we connect to the oldest science ever practiced by humans, tracking! Tracking is the art of reading the landscape, it gives us a window into the mind of what we track, and through that window we gain a greater appreciation for and understanding of the world around us. The hallmarks of cultures are the technologies derived from the landscapes around them. It is by re-inventing the wheels of our past that we come to know who we are. Whether by hunting, gathering or just creating comfort in the wild, we learn to solve life's challenges by crafting tools from the raw materials we've gathered with our own hands. Journals are an essential part of our studies. Our approach to journaling combines the land of a serious academic examination and an artistic exploration of the subject. The process of journaling in this manner is a great aid in learning to identify plants, trees, birds and animals and their tracks. This is a way to help develop a “minds eye”, creating visual images to aid reflection. In addition to all the amazing activities above we also have regular choice activities like arts & crafts, swimming in our pool, reading or relaxing time at "hammock city", solving routes on our climbing wall, fishing, music, card games, movie night, and so many other awesome choice activities. We grow a large portion of our produce, meat, and eggs on our homestead or source locally. We grow with organic practices enhanced by an awareness of natural cycles that impact our land, plants, and animals throughout the year. We source and cook our food with care and love. 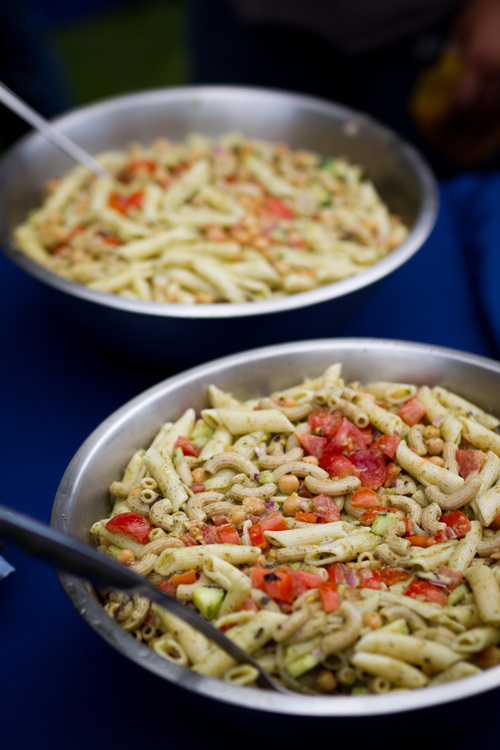 We eat our food family-style in the dining hall or picnic style outside on the land, making meals a time to celebrate and enjoy our community. We do most of our work by hand, ensuring lower emissions and a closer relationship with the ecosystem we are privileged to steward. Waubanong's biodynamic garden is a source of amazing bounty and beauty. Making full use of the camp's greenhouse to jump-start our growing season, we have been growing literal tons of vegetables. The garden provides the majority of our salads and most of our kitchen's vegetable needs. Campers and visiting students are involved in the garden at every level, from composting to planting, to transplanting seedlings, to weeding and harvesting. We have seen an exponential rise in children eating vegetables in the dining room as a result of being involved in this process. We love to be with them and care for them with young people. We enjoy sharing work and teaching the values and benefits of work in the animal spaces. Our animals improve the fertility of the land that we steward. Serving Delicious, Home-Grown, Home-Cooked meals. Waubanong serves incredible food and staffs a dietitian who designs our menus to ensure proper nutrition for our action packed weeks. We have re-appropriated the term "camp food"-- we believe in the kind of healthy, whole foods that your grandparents used to eat-- we enjoy the pleasure of eating from the garden along with the moral satisfaction of doing the right thing for ourselves and the planet. Here you often get to thank the chickens who laid your breakfast eggs, harvest the vegetables for your lunch-time soup and salad and pick the fruits that will go into the evening's dessert. Meals at Camp Waubanong are a healthy and creative endeavor thanks to our farmers' and chef's leadership and love, and we eat them family-style. That means we all sit, talk, and eat together in celebration of our community around the table.